Socket screws with internal drives came into existence over 100 years ago and developed along with the Holo-krome, Allen and Unbrako brand names. Acceptance of the internal-wrenching hexagon drive was slow in its adoption first being taken up for tool and die work and then in manufacturing; after 1945 the socket family came into widespread use. During the 1970’s the brand control of the global market declined with the introduction of socket screws from Europe rapidly followed by Japan and currently Taiwan and India. Socket head cap screws with an internal hexagon drive are used in a lot of applications where strength is required, or the number of fasteners used needs to be reduced because of limited area, The internal hexagon is tightened with a hexagon wrench ‘key’ and may be used where the head of the screw must not protrude above the clamped surface, the head is accommodated in a counterbored hole. Metric socket cap screws in Alloy steel are in high strength grades 12.9 for both the USA, UK and European markets; there is also a demand for class 8.8 and 10.9 mainly in Europe. Stainless steel A2 -70 and A4-80 are available as a Socket head cap screw, A4-80 have become more readily available in the UK market. It is mandatory to mark the strength grade and the manufacturer’s identification on the head of the socket screw for sizes M5 and above. Inch Unc/Unf socket cap screws are to American specification ANSI B18.3 and have a hardness of RC38/43 within the same range of a 12.9 socket cap; Inch BSF/BSW socket cap screws are to British specification BS2470 and have a similar hardness range of RC39/43. Low head socket cap screws are used where a lower head profile is required or where space is not available for a full depth counterbore. Inch UNC/F have no American standard and are not shown in the British standards; metric screws are to the popular DIN7984 standard and are also available to DIN6912. Low head cap screws are produced in class 8.8 and 10.9 and are also available in A2 stainless steel. It is mandatory to mark the strength grade and the manufacturer’s ID on the head of the low head cap screw on size M5 and above. Socket countersunk head screws are called flatheads in the USA, are used in applications where no screw head protrusion is allowed. Often used to clamp thin section parts. Standard metric steel countersunk socket screws are made in strength classes of 8.8, 10.9 and 12.9, 10.9 grade is most common in the UK and Europe. The geometry of the countersunk head reduces the maximum load capacity of these fasteners, substantially lower than that of a socket head cap screw. The coating is self-colour, the 10.9 and below are normally electro zinc plated. Stainless steel screws are available in both A2 and A4 materials. Head must be marked with strength grade and manufacturer’s ID. Socket button head screws or button caps as they are called in the USA have an internal hexagon drive and are used where the materials being joined are too thin for a countersink, or where a smooth surface appearance is required in the case of desks and chairs. Socket button head screws in alloy steels are available in high strength grades 8.8, 10.9 and 12.9, the 10.9 grade being more common in the UK because the geometry of the button head reduces the maximum load capability. The product is available in the as finished black state and more commonly zinc electro-plated. Socket buttons are available in stainless steel A2-70 and A4-80. Socket flange button head screws are required to spread the bearing face load and eliminate the need for separate washer improving assembly times. Socket flange button head screws are available in strength class 10.9 but can be produced in 8.8 grade. The standard generally used for this product is ISO 7380, but flange sizes may vary slightly. Hexagon Socket head shoulder screws or stripper bolts as they are called in the USA act as shafts or dowels for rotating items such as bearings and bushings, axles for rolling parts, guides for sliding elements, and pivot points or mounting pins and for accurate location in jigs and fixtures. Shoulder screws have three main sections: head, shoulder, and thread. The head has the largest diameter, the shoulder is described by its diameter and length, and the thread has a major diameter slightly smaller than the shoulder diameter. 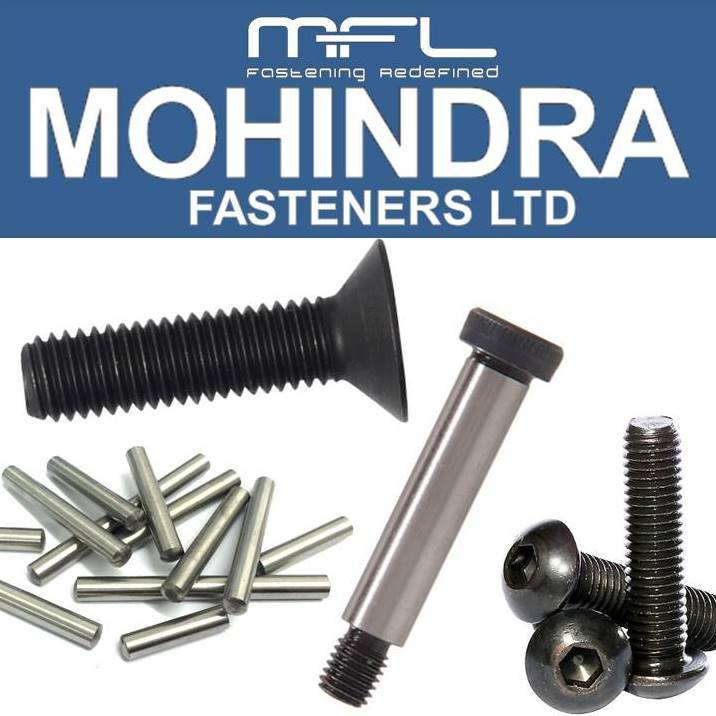 In Europe shoulder screws are generally specified by thread diameter and shoulder length, in the USA by shoulder diameter and then by shoulder length; to avoid confusion both diameters and the shoulder length should be stated for example M10 (thread) 12mm (body) and 50mm body length. The shoulder or body diameter is precision ground to f9 or H8 close tolerances, and the concentricity of the shoulder to the thread and head should be maintained. Shoulder screws are produced to class 12.9 to give increased wear resistance on the precision ground body. Shoulder screws are also available in Metric A2 and inch 18/8 stainless steel. Care should be taken when calling for metric BS4168 on shoulders 12mm and 16mm as the head sizes are different compared to ISO7379. Socket set screws are used to generate a compressive load, as opposed to a fastener tensile load that we see with the installation of bolts and screw. Their purpose is to hold parts beneath the cup or points, and withstand any rotational movement or lateral displacement and also to resist vibration. The holding power of set screws is determined by their seating torque, accordingly socket set screws are made of the highest class or grades and have internal hexagon drives. Lower tensile set screws have slotted drives, and are traditionally called grub screws. Cup - Hollowed end, is the most commonly used point style. Used when the digging in of the point is not undesirable, leaves a ring mark. Cone - Pointed end, this type of point generates the highest torsional holding power and is typically used for a permanent connection. Knurled cup point is a cup point with knurls' cut on the outside of the cup for improved locking. Oval - Rounded end that is typically used when frequent adjustment is required. The oval end reduces indentation damage. Flat point causes little damage to the shaft and are used when frequent adjustment is required. Thrust point is a rounded point the allows movement at the base of the set screw. Tips at the end of the set screw are in various soft materials like plastic and copper are designed to reduce damage. Set screw containing a spring and ball bearing. Hexagon wrench keys also called Allen keys are designed for tightening socket screws by hand. The main dimension is the across flats of the hexagon that corresponds to the internal hexagon drive on the socket screw. The range goes from metric 0.71mm to 32mm across flats and in inch keys from 0.028” to 1.7/8”. The arm of the key is available as a standard called a short arm and also as a long arm. They are made from steel heat-treated to high hardness values, and in the USA the commercial key is made of alloy steel and is called a 6150 key, the higher grade alloy key the 8650 is similar to the material used by Unbrako and Holo-krome.